For some reason this year, the gap between Halloween and Christmas feels like no time at all. Work is incredibly busy and will continue to be so right up until the 23rd of December, but then, THEN, I get 2 weeks off, and right now I honestly can’t wait. I love Christmas shopping and buying presents for loved ones, and I’ve made a good start already. Hopefully, I’ll have 80% of it sorted by the end of the month. In other news, I’m really struggling with the dark evenings and increasingly darker mornings. I used to think I was a Winter person, but I take it back, I’m so not. I just want to hibernate. I’m still going to the gym, and I’ve started going three times a week instead of two, but going after work when it’s already dark? The struggle is real, guys. Code Name Verity by Elizabeth Wein – This has been ALL over the book community. I got the second book in the duology, Rose Under Fire, first. Now I own both, I can binge them. The Impossible Knife of Memory by Laurie Halse Anderson – This is apparently quite an emotional read that I’ve heard about since I started book blogging, so I thought it was about time I tried it. Unteachable by Leah Reader – I can’t remember where I first saw this, but the story grabbed me – the taboo of a student-teacher relationship! Dangerous Girls by Abigail Haas – Charnell @ Reviews From A Bookworm raved about this, along with other bloggers who I can’t remember right now. I’ve read it already and LOVED it. Gripping, page-turning, oh-my-God-ness all over the show. Review coming soon! Dangerous Boys by Abigail Haas – Another one Charnell loved. Although the titles are similar, the stories aren’t connected. After reading and loving Dangerous Girls, I’m excited to get to this one. Forbidden by Tabitha Suzuma – Pretty sure I have Charnell to blame for this one too! I’ve been told it’s a brother-sister love story, but so well done, and so well told, it’s kind of impossible not to love this book. Unwind by Neal Shusterman – This was highly recommended by Nicole @ Feed Your Fiction Addiction. The premise sounds SO intriguing. It’s book 1 in a series, so I guess there’ll be more new books in my future?! Oops. Am I Normal Yet? by Holly Bourne – I’ve seen great reviews for this, but I held back from getting it, because I thought it was aimed at young teens, then my rating-twin Trish @ Between My Lines said she loved it, so I had to pick it up. The Serpent King by Jeff Zentner – Stef @ Caught Read Handed loved this and highly recommended it. I wouldn’t have picked it up based on that cover or title. BUT, it’s meant to be great, so I’m looking forward to it. The Miseducation of Cameron Post by Emily M. Danforth – Pretty sure I heard about this on BookTube, but it hit mainstream headlines when it was banned from a Delaware high school’s recommended reading list, and was subsequently given away for free to students by a local bookstore. Three Dark Crowns by Kendare Blake – This has been gaining popularity, but I originally heard about it from BookTuber, Sarah Jane @ The Book Life, and then Nicole recommended it too. Sold! The Winner’s Curse by Marie Rutkoski – Who hasn’t heard about this book? I’d never read them, but still weighed in when the publisher changed the cover before the release of the last book. Recommended by everyone, but especially Sarah Jane. It had to be done. The Archived by Victoria Schwab – I own A Darker Shade of Magic by Schwab, but I haven’t read it yet. I saw this doing the rounds on BookTube ages ago, and finally decided to get it. I have high hopes for Schwab. Something Like Normal by Trish Doller – I remember a blogger writing a whole post dedicated to Trish Doller’s books, and it stuck with me (not enough to be able to find it again, but if I do I’ll link it!). I love a good contemporary and this did not disappoint. Review to follow! The Bar Code Prophecy by Suzanne Weyn – I read and loved The Bar Code Tattoo when I was a teenager, and I recently picked up a copy of the second book, The Bar Code Rebellion. When I saw the third and final book in the series, I had to get it. I want to binge them, and I’m really hoping I love it now as much as I did when I was younger. The Sea of Tranquillity by Katja Millay – This seems to be everyone’s go-to book for YA/NA contemporary and mental health, and apparently the writing is beautiful. Really looking forward to reading this! Everyone who gave me a recommendation on Twitter was entered into a prize draw to win a book of their choice! The winner was Sarah Jane from The Book Life on YouTube, and she chose This Savage Song by VE Schwab. This month, I treated myself to a gorgeous copy of The Handmaid’s Tale. Anyone who knows my reading tastes kept recommending it to me, so when I saw this edition, I decided it was time! For a while I was watching The Gilmore Girls, I’ve gotten to the college years but I’ve had to take a bit of a break. I do like the show, but find it can be a little slow. This month I watched a few shows on Netflix including some David Attenborough, some true-crime documentaries, and the pretty brutal, but equally necessary, Netflix documentary Audrie and Daisy. Simon @ Savidge Reads posted Other People’s Bookshelves, which made me drool! Ginger @ GReads asks have you become a picky reader too? It’s unlikely you missed much around here in October, as I barely posted anything! I have SO many reviews to do, and honestly I wish I could verbally dictate them all, have them turned into blog posts, edit them, and be done with it. Does anyone know if this is possible?! No? Guess I’ll have to do it the old fashioned way then. So, the only thing I posted last month (which, to be fair, did take AGES to put together) was my 2016 Bookish Gift Guide with 22 exclusive discount codes. I’m very proud of this post, and hope all my bookish buddies will be able to treat themselves, and their bookish friends, with some gorgeous items at a bargain price. What’s not to love? I also made a separate post about the Wordery discount code and special Christmas Collection they kindly put together just for the Gift Guide. My most popular post in October was of course my Gift Guide above, and my most popular review was for All The Light We Cannot See. What did you get up to in October? Let me know in the comments! Oh, wow. I love that copy of A Handmaid’s Tale! I wonder if it’s available here? Winter tends to bring on the gloom for me. Added to the fact that winters in Canada tend to go on longer than it should, I dread the winter months. Two weeks off sounds fantastic! I so wish I can have a Christmas break! Wordery ship internationally for free, so you should be able to get it through that link. Thanks for sharing my post!! So glad you listened to your rating twin and bought Am I Normal Yet?, Now I regret not telling you to buy the whole series. Proof that book pushers are never happy! I also loved Dangerous Girls, even though it messed with my mind. And The Sea of Tranquility is unforgettable, and the writing is amazing. And I loved The Winners Curse too, it’s full of games and a heroine who uses logic and strategy to get her way, I love that! I have the Trish Doller book but haven’t got around to reading that one yet. And now I’ve just seen Code Name Verity, that’s also amazing but don’t get bogged down by all the flying talk, it’s not important. Basically I’m hyperventilating over your entire stack 😀 Enjoy! The Trish Doller book was good! I think you’ll enjoy it. It was a quick contemporary, but just how I like my contemporaries, with some underlying issues/mental health stuff. She was really hyped up for me though, so wasn’t quite a 5*. 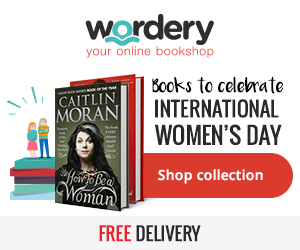 ← Exclusive Wordery Discount Code!